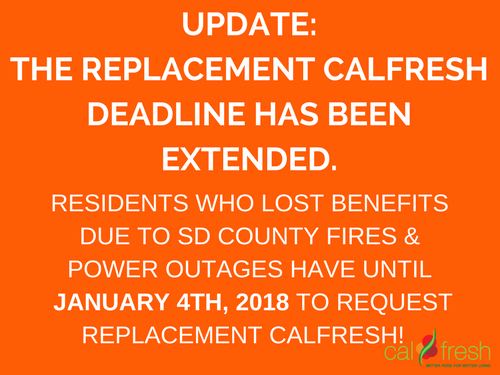 Due to the number of residents affected by power outages and wildfires in San Diego County, the County of San Diego Health and Human Services Agency received a waiver that extends the deadline to request Replacement CalFresh. Residents who lost benefits and live in the impacted zip codes below have until January 4, 2018 to request Replacement CalFresh. The impacted zip codes include: 91901, 91905, 91906, 91916, 91917, 91931, 91934, 91935, 91948, 91962, 91963, 91980, 92003, 92026, 92027, 92028, 92036, 92054, 92056, 92057, 92058, 92059, 92060, 92061, 92065, 92066, 92069, 92070, 92082, 92083, 92084, and 92086. Residents requesting replacement CalFresh must complete a CF 303 Form (English | Spanish) and an Affidavit of Loss form (English | Spanish). These forms must be submitted in person at a County of San Diego HHSA Family Resource Center (find a location here) or the Local Assistance Center at the Vista Branch Library (700 Eucalyptus Avenue). Benefits will be restored to the CalFresh EBT card for that individual or household. The maximum replacement benefit individuals can recoup is one full month’s worth of benefits. Replacement Requests will be processed and benefits will be reissued within 10 days of submitting. Local Assistance Center is located at the Vista branch library at 700 Eucalyptus Avenue and will be open from 9am- 6pm. the site will remain open until Saturday, December 16th. Residents who live in the unincorporated part of San Diego County may call the Recovery Assistance Hotline at 858.495.5200 or email CountyFireRecovery@sdcounty.ca.gov. We fight hunger in San Diego county. Stats on hunger say that an estimated 476,000 San Diegans are food insecure. Hunger affects children, veterans, senior citizens, and many others. The Hunger Advocacy Network’s Annual Legislative Breakfast, facilitated by the San Diego Hunger Coalition, provides a forum for elected representatives to learn about food insecurity and the opportunities they have to address hunger in their roles as community leaders. Feeding Minds and Bodies at the Library was a workshop facilitated by the Hunger Free Kids Task Force with support from the San Diego Hunger Coalition. Libraries across the U.S are providing meals alongside their summer, after school, and weekend enrichment programming with hopes of keeping children properly nourished and engaged. Chag Pesach Sameach! Happy Passover to our Jewish friends and partners. May you have a peaceful and hunger free holiday.